Step 1 > Finding your spot may be the single most important step. You’ll want to be approximately 5 paces or 12 feet back from the target, behind the black throwing line. Take one step forward with your non-dominant foot, so if you throw right-handed your left foot would be slightly forward. The goal is to coax your axe into making one revolution before hitting the bull’s eye. Step 3 > Bow to your partner. In other words, there are two targets in one bay, so make sure you and the other lumberjack throw together and retrieve together. Staying in sync gives you a rhythm, won’t distract in your peripheral and, this should go without saying but, it is critical to your safety. Step 4 > Bring the axe straight back behind your head and throw it straight forward, keeping your wrist and your elbow locked. Release when your arm is extended, parallel to the ground. Imagine throwing a soccer ball for a two-handed throw and a baseball for a one-handed throw. The most common mistake new throwers make is flicking the wrist when releasing the axe. What you want to do is just “let it go, let it go” when the axe is exactly vertical and your arm is straight. There you have it, tried and true tips for sticking the perfect axe. Once you get your groove, keep practicing until muscle memory takes over. 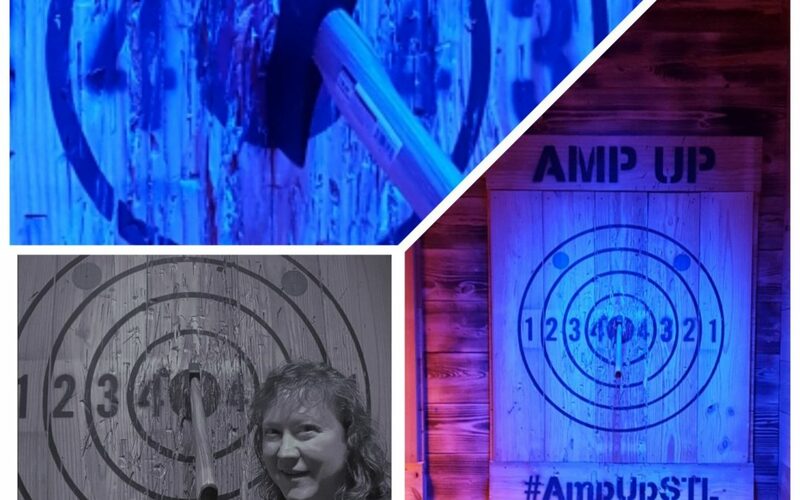 If you live in or near St. Louis, stop by Amp Up Action Park to get personal instruction from one of our many axe-perts.